The Russian arms industry has developed a plan to replace its Ukrainian suppliers, lost during the latest crisis in this country, with companies in Belarus and Kazakhstan, an influential Russian daily reports. Deputy PM in charge of the defense sector, Dmitry Rogozin, earlier announced the Russian government would prepare a plan on import replacement in conventional weapons and present it to the President. On Friday the mass circulation daily Izvestia reported the plan was ready and will be presented as soon as Monday. 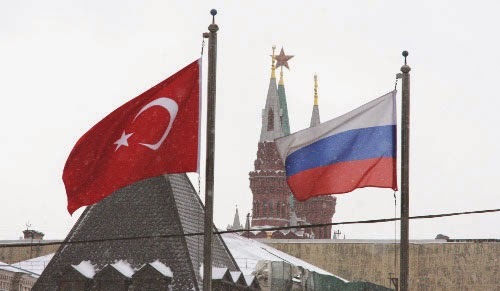 Turkey has raised the question of establishing a free trade zone with the Customs Union of Russia, Belarus and Kazakhstan, Russian Economic Development Minister Alexei Ulyukayev said after talks with Turkish Economy Minister Nihat Zeybekci. The Turkish minister put forward an initiative for closer cooperation with the Eurasian Customs Union, Ulyukayev said. "We have discussed the possible forms of cooperation, including the formation of a free trade zone between the Customs Union and Turkey. We have agreed to create a working group and to begin a more detailed discussion of these possibilities and prospects in September," Ulyukayev said on the sidelines of the meeting of G20 trade ministers in Sydney, Australia. Republican People's Party (CHP) Deputy Chairman Bülent Tezcan shared police records on Monday concerning the search of a National Intelligence Organization (MİT) truck in Adana as part of an investigation several months ago, asserting that the records prove that the Turkish government has supported radical groups in Syria and Iraq. He said the records leave no room for doubt that the government has sent weapons and ammunition to the terrorist organizations al-Qaeda and the Islamic State of Iraq and the Levant (ISIL) in Syria. Tezcan held a press conference on Monday on the grounds of Parliament and shared documents about arms-laden trucks, which later proved to belong to MİT, that were stopped in Adana by security forces in January of this year. He said between 25 and 30 rockets were found in each truck. He also showed that the documents that were attached to the weaponry found on the trucks were written in Cyrillic. He claimed that the weapons were loaded onto the trucks at Ankara Esenboğa Airport, citing official testimony from a driver of one of the trucks. Tezcan said the documents clearly show that MİT transfers weapons to armed groups in the region. An underground counterfeiting network suspected of having generated funds for "extremist organizations" was shut down during a massive police operation in Dagestan. About 300 officers from the Interior Ministry and Federal Security Service took part in the operation, which included 23 raids on offices, garages and apartments allegedly used to facilitate the printing of at least 1 million rubles' ($29,000) worth of counterfeit notes, according to a statement released by the Interior Ministry on Tuesday. The statement said police also found equipment to manufacture phony $100 bills. At least 1 million rubles in fake bills had already been used throughout Russia's Southern Federal District, primarily in the North Caucasus. 98 “five-time” mosques have reportedly been suspended in the northern province of Sughd for failure to register. “Some of these mosques located in the Bobojonghafourov, Jabborrasoulov and Zafarobod districts will function during the holy month of Ramadan at the request of residents of these districts but they will be suspended after Ramadan until they are registered with the Department for Religious Affairs,” the head of the Sughd Department for Religious Affairs, Suhrob Rustamov, told journalists in Khujand on July 23. Sughd province now has 960 registered “five-time prayer mosques (mosques for daily prayers), 91 Friday prayer mosques (larger facilities built for weekly Friday prayers) and 13 central mosques, Rustamov said. 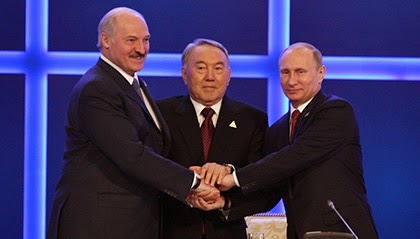 At least 16 citizens of Kazakhstan have joined the extremist organization of Islamic State of Iraq and the Levant, Kazakhstani TV channel KTK reports July 21. According to the report, the presence of the Kazakhstanis among the organization became known when the video allegedly showing the Kazakhs with weapons talking about their aims was uploaded in the web. In the video, a man, Abu Anisa, speaks in Kazakh language of the “seriousness of their intentions” and says he fights for the creation of a new Islamic state on the border between Syria and Iraq, KTK said. The number of Kyrgyz citizens fighting in Syria continues to grow, concerned Kyrgyz authorities say. "The impact of Salafism, especially of its radical forms, has been clearly on the rise in recent years," Ryskulbek Japarkulov, chief of the Interior Ministry (MVD)'s 10th Main Administration, told Central Asia Online. "The MVD has discovered 15 cases of terrorist groups' recruiting youth to fight as mercenaries in war zones such as Syria, Afghanistan or Pakistan. Eight of those cases have led to prosecution, and we are verifying and investigating the rest. China’s neutral stance towards conflicts in Afghanistan means the Taliban are not bothered by its involvement in the region. “We have no problems with China as it has never interfered in Afghanistan. The Chinese will be safe,” said Taliban spokesman Zabihullah Mujahid in reply to emails. Mujahid adds that since China has not been militarily involved in Afghanistan and is only focused on economic and trade relations, the Taliban will not harm its projects. Haseeb Sediqi, spokesman for the National Directorate of security (NDS) told reporters that the North Waziristan operation did not have any satisfactory outcome since the offensive did not harm any of the terrorist networks. Sediqi further added that one of the most important terrorist network – Haqqani Network remained safe from the offensive as the network leaders were taken to safe locations along with several leaders from other terrorist networks. He said NDS has received information which shows that the Haqqani Network leaders were shifted to Kurram agency, Quetta, Karachi and even Islamabad. According to Sediqi, the Haqqani Networks leaders, members and their equipments including weapons were taken to Kurram agency two weeks before the offensive was launched. China has banned bus passengers in the capital of western Xinjiang region from carrying items ranging from cigarette lighters to yogurt, state media said on Friday, in the latest effort by authorities to prevent violent attacks. 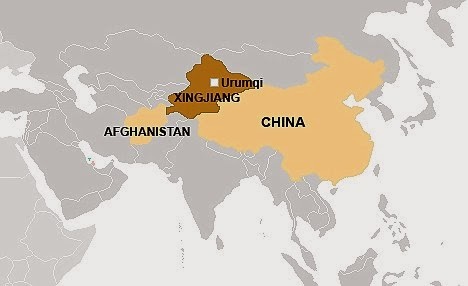 The new rules in the capital Urumqi, similar to restrictions usually imposed by airlines, reflect how nervous officials are about trying to contain outbreaks of violence in the region, home to the Muslim Uighur minority. The local government in Urumqi, a city of three million, issued new rules after a transport security meeting, barring passengers from bringing on board liquids, lighters and unknown powders "to strike a severe blow on all forms of criminal activity on public buses," the state-run Legal Daily said.